Today I want to show you two of the cards I made at an earlier time. We're in the birthday spirits here with mine coming up very soon. I want to show you two male cards. The first one is one with a Magnolia Edwin Stamp. For this card I used varied Basic Grey Origins 6x6inch design papers. I really like this collection a lot due to the use of greens, yellows, blacks and browns. This combination with the prints used, work great. It makes great use for male cards. I also used Lifestyle Crafts dies ( previously named Quickutz) for the back ground. I hand stitched it with DMC brown yarn, used Magnolia fence and tag dies, Tim Holtz floral stamp, copics to colour Edwin. I choose not to ink this card and use the papers bare as I would explain it. 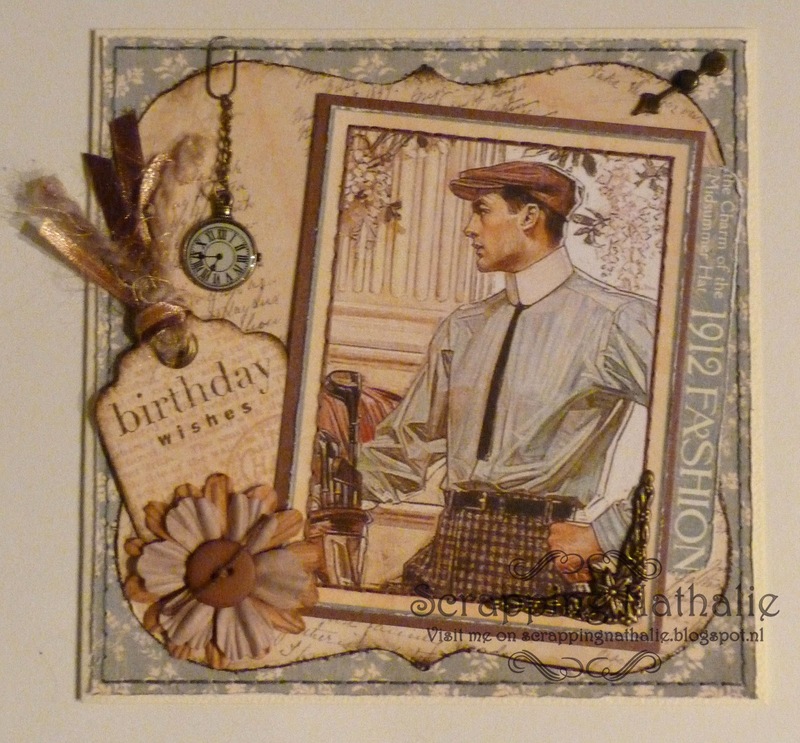 Next I want to show you a male Birthday Card that I made with Graphic 45 A Ladies Diary papers. This line is mainly female themed but there are a few images that are great to use for male cards and this one is one of them. I've used the Graphic 45 papers for the backgrounds and tags. 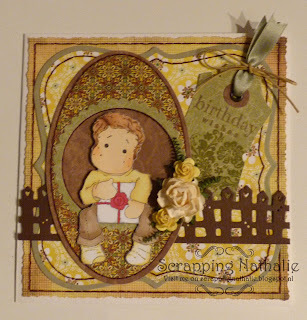 The tag is a Sissix BIGZ die and the shaped background is a Lifestyle Crafts die. I used an Inkadinkado clear text stamp for the Birthday wishes, various metal embellishments and ribbons, the image is hand stitched with brown DMC yarn to make it pop a lil more. Everything is inked with Colorbox sepia Cateye ink.